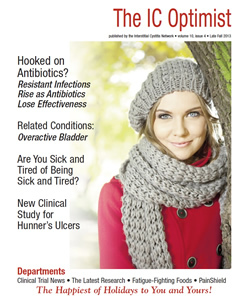 (1) Feature Story: Hooked on Antibiotics - Resistent infections rise as antibiotics lose effectiveness - If you become infected with a bladder infection resistant to the most common medications, how will you treat it? Do you ride it out and hope that your body can defeat it naturally? Can you afford to use more expensive antibiotics? Would you be willing to try an antibiotic that is more harmful, perhaps one that could cause kidney failure? This is the choice a growing number of patients and physicians are facing as antibiotic resistant infections skyrocket. We've had a growing number of calls from patients struggling with unusually resistent bacterial and yeast infections that are so strong that they’ve been able to resist many, if not most, of the common antibiotic and antifungal treatments. This in-depth article shares the latest information and provides tips on how you can reduce the risk of contracting a resistent infection and help stop this public health disaster. (2) Related Conditions: Overactive Bladder - We’ve continued our discussion of the related conditions to IC with a review of overactive bladder (OAB). 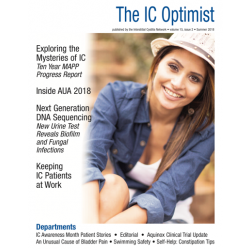 Many IC patients today are first diagnosed with OAB and often wonder what the difference is between the two conditions. Simply put, it's about "urgency." Patients with OAB rarely have pain, rather they run to the restroom to avoid leakage. In this article, we cover how a diagnosis is made and the treatment options now available! 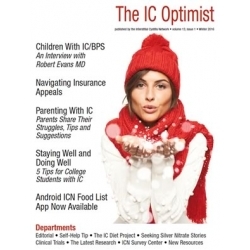 OAB therapies often overlap with IC therapies. (3) The Latest Research - A couple of new research studies got our attention this Fall. 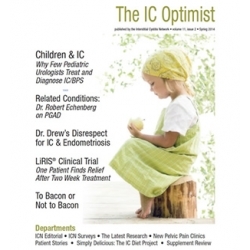 The fabulous IC and diet research team at LIU produced the first study showing that men with prostatitis have very similar diet sensitivities to patients with IC. Interestingly, advocates of the medical marijuana will be surprised to learn that the state of Illinois has now approved its use and specifically mentions interstitial cystitis. (4) Clinical Trial News - Several new clinical trials were launched this Fall that you may find interesting, including the use of LiRIS® to treat Hunner’s Ulcers. If this study demonstrates that LiRIS® aids in the healing of ulcers, it could be fast tracked as a new treatment by the U.S. FDA. Canadian patients will also find a study for a new bladder and pelvic pain medication. (5) Introducing Painshield MD - A new, portable ultrasound device is now offering relief for some patients struggling with pelvic pain. (7) Self-Help Tip: Are you Sick and Tired of Being Sick and Tired? - Dietitian Julie Beyer shares strategies on how to increase your energy levels with simple, practical suggestions you can do at home and at work. (8) Simply Delicious, The IC Diet Project: Fatigue Fighting Foods - As part of our 2013 IC Diet Project series, we share a list of foods that are IC friendly and surprising helpful in increasing energy and fighting fatigue! (9) What's New in the IC Shop: Ending Male Pelvic Pain - Author and physical therapist Isa Herrera has just released her second book covering pelvic pain and pelvic floor dysfunction, this one for men! struggling with prostatitis, pelvic pain, sexual pain and/or those recovering from prostatectomy. She provides an indepth discussion of pelvic floor rehabilitation and provides at home tips and exercises!